It's a lazy Sunday, and if you have nothing to do but set your clocks back, why not see a great little comedy? 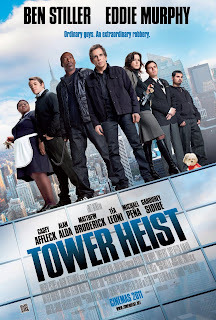 I saw a preview of Tower Heist with my wife and friends recently and enjoyed it so much more than I expected to from the so-so trailer I saw. Ben Stiller plays a genuinely nice guy, a fastidious building manager who finds himself hatching a scheme to rob the secretly cruel despot Alan Alda and repay the poor serfs who toil beneath his penthouse. 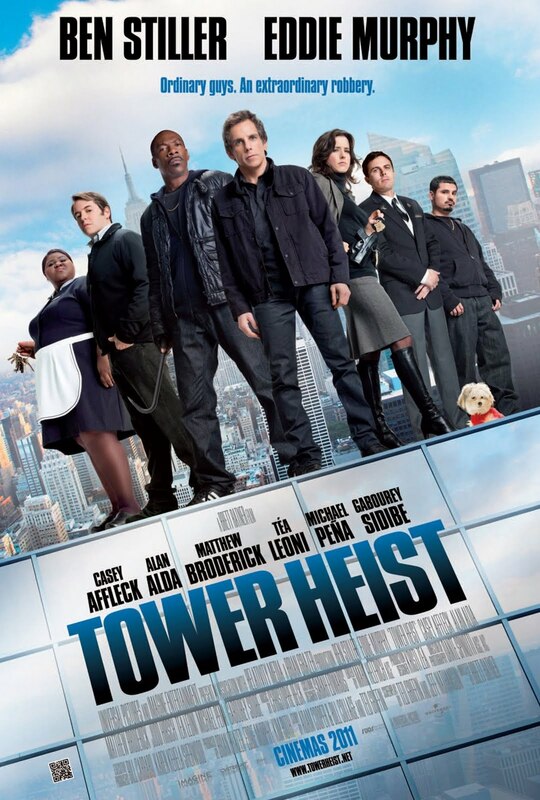 Eddie Murphy is a riot as the more practical thief Stiller bails out to assist him. Lots of laughs, some of my favourites came from sad-sack laid-off Matthew Broderick and safe-cracking, wise-cracking Gabourey Sidibe. And I'm impressed as ever by Tea Leoni. You know what? Great work all around. It's a mark of distinction for me how loudly I heard my wife laughing throughout. Please see a fine review at WISDOM OF BOOKMONKEY now. Then treat yourself to a little comedy wish fulfillment from the emotional core that yearns for justice in matters of greed and brings us the Occupy Wall Street movement. Do not give in to the desire to pirate the movie itself, despite the madcap robbery theme.